Dry Ice experiments are always a classroom favorite and this great collection of 39 experiments, all of which explore the properties and effects of dry ice, are sure to bring the house down. Demonstrations allow you to show your students how dry ice is used to produce fog effects for movies and haunted houses, that carbon dioxide is denser than air, the effect of extreme cold on different substances, how much volume a piece of dry ice will occupy as it sublimates and more. There's also great fun in all that learning as you replica a comet, create a super-powerful "squirt gun", and make a tremendous fountain. 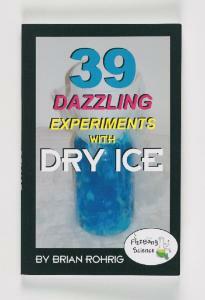 Explains where to find dry ice, how to store it, and how to use it safely. Written by award-winning science teacher Brian Rohrig. 104 pp., softcover.